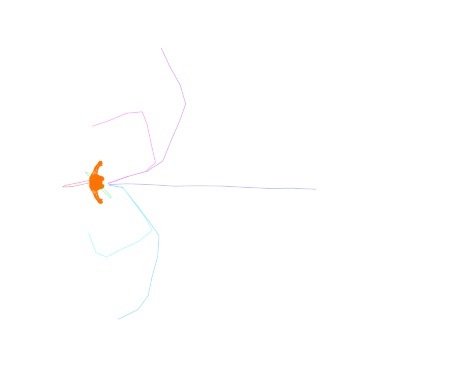 A Navigation And Locomotion Behavior (BeNavNadLoco) uses a set of Motion Clips and dynamically blends them together to reach the current target position of the entity (given by a Go To Behavior) while avoiding other Entities. Contrary to the Locomotion Behavior, this behavior does not work together with the Navigation Behavior, as it replaces both the navigation AND the locomotion. See the algorithm part for a more detailed explanation on how this behavior works. As the NavAndLoco Behavior may blend any pair of Motion Clip in its set, it is recommended to only use Motion Clips with the same style. For instance, if there is one motion with arms up and another with arms down, the character will constantly move arms up and down as a side effect of the locomotion, which is usually not expected. In such a case, two different NavAndLoco Behaviors (one for arms up, the other one for arms down) should be created, and the switch between the two made when desired by using a trigger. Best practices for the creation of the motion set are described here. A NavAndLocoBehavior defines the following specific attributes. For common attributes see Behavior Common Attributes. Motions Clips to use in the NavAndLoco System. You can specify a replay speed ratio for each Motion Clip. It is recommended to use replay ratio near 1 (between 0.3 and 1.2 seems reasonable values: slowing down motions is more likely to be perceived as real than speeding them up). 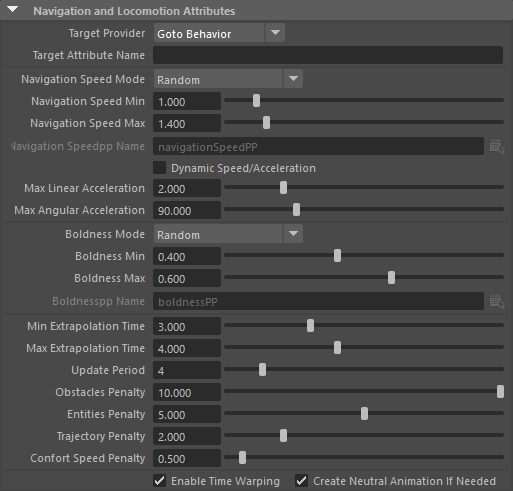 Each animation can use a different Motion Mapping by setting the Mapping index in the Mapping column. Mapping index refers to the number written in the Motion Mapping File[n] label (see below). Use the "Add New Motion Clip" button and the trash icon to add or remove motions. Use the ">" button to select the related Motion Clip node and access to its attributes. Use the icon to mirror the relative animation ( to load the original animation, to load the mirrored animations, to load both original and mirrored animation). It is recommended when you don't have both the turn-left and turn-right motions. In this case, use the mode to load both original and mirrored motion at the same time. Use the icon to enable / disable a Motion Clip without removing it from the behavior. You can add Motion Clips (and their related motion files) directly by double-clicking on the behavior in the Behavior Editor and by selecting one or several motion files in the dialog. Notice that the provided Motion Clips need to define a root translation and/or delta orientation (used to compute the original velocity of the motion). See the Motion Tab of the Character Maker or the Motion Clip attributes to see how to ensure Motions are correct and edit them. The Starting / Stopping Duration value determines the time (in seconds) during which the animation goes from inactive to fully active (or vice versa). This time can be used to transition smoothly between two behaviors. When transiting from one Motion/Locomotion behavior to another, it is the average time between the Stopping Duration of the stopping behavior and the Starting Duration of the starting behavior which is used as transition time. Per-Particle Attribute: Use the "Starting / Stopping Duration Name" attribute to get the name of the float per-particle field of the relative particle system, containing the Start Percent value. The Starting / Stopping Duration value is in seconds. Available only when the Starting / Stopping Duration Mode is set to "Random"
Available only when the Starting / Stopping Duration Mode is set to "Per-Particle Attribute"
When fine-tuning the transition between two consecutive Motion or Locomotion behaviors, it's advised to use the Animation Transitions, which will automatically fill the starting/stopping durations of the behavior. By default, a motion is played on the entire body (as specified in the Motion Mapping File). But the Motion Mapping File configuration can be filtered by the body mask to replay the animation only on specified channels. Pelvis If this box is checked, the pelvis part of the motion will be played. The pelvis part includes the global position and orientation of the animation. If not checked, the animation will be played "in place"
List of the limbs channels to play on the entity. Use the button to open a window with the name of all the available Limbs for the Character Files loaded in the scene. Those names can also be found in the Motion Mapping Panel of the Character Maker. Effector Channels List of the effectors ​channels to play on the entity. Use the button to open a window with the name of all the available Effectors for the Character Files loaded in the scene. Those names can also be found in the Motion Mapping Panel of the Character Maker. 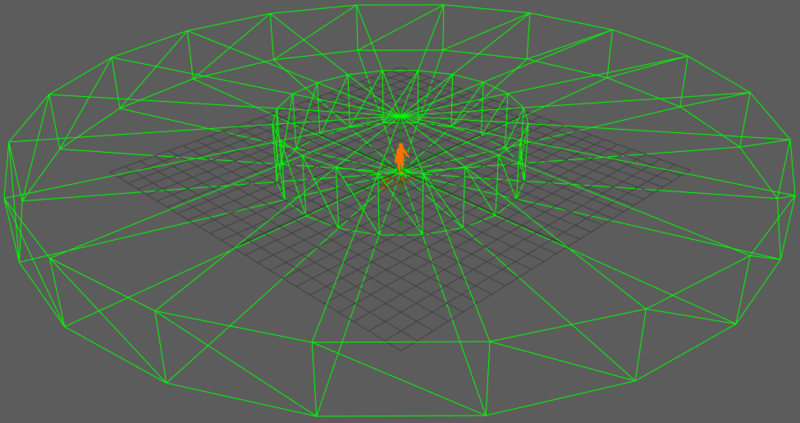 List of Blind Data Nodes or Blend Shape Groups to play on the character. Use the button to open a window with the name of all the available Blind Data Nodes and Blend Shape Groups for the Character Files loaded in the scene. Those names can also be found in the Skeleton Mapping panel of the Character Maker. Star ( * ) wildcard is authorized at the beginning or/and end of names (i.e. mouth*, *eye, etc.). Separate the Group names by comma ( , ), leading and trailing spaces will be ignored. Use the * wild card to use all Groups. Blind Data List of Blind Data or Blend Shape to play on the character. Use the button to open a window with the name of all the available Blind Data and Blend Shape for the Character Files loaded in the scene. Those names can also be found in the Skeleton Mapping panel of the Character Maker. Separate the Blind Data / Blend Shape names by comma ( , ), leading and trailing spaces will be ignored. Use the * wild card to use all Blind Data / Blend Shape. Available only when the Start Percent Mode is set to "Random"
Available only when the Start Percent Mode is set to "Per-Particle Attribute"
If several Motion or Locomotion behaviors are played at the same time on the same part of the body, only the behaviors with the highest priority will be played. If several behaviors share the same priority, they will be blended together according to their weight normalized value (for instance, if two Motion behaviors share the same priority with a weight value of 1, they will be blended each at 50%). Available only when the Weight Mode is set to "Random"
Available only when the Weight Mode is set to "Per-Particle Attribute"
This layout shows the Sensors that are used within the navigation behavior. Sensors list When Use Default Sensors is disabled, this control shows all the sensors that the navigation behavior uses (mapped to the CrowdBeNavigation node). Use the "+" and "-" buttons to add or remove sensors among the Sensor Locators in the scene. Without any mapped sensors, the navigation behavior will not be able to avoid entities or obstacles. Random: the navigation speed is set randomly between the values Navigation Speed Min and Navigation Speed Max. The navigation speed is influenced by the random seed of the Crowd Manager. Per-Particle Attribute: the navigation speed is read from the per particle float attribute given by Navigation Speedpp Name. The Navigation Speed value is in Crowd units. Navigation Speed Min See the Random option of the Navigation Speed Mode described above. Available only when the Navigation Speed Mode is set to Random. See the Random option of the Navigation Speed Mode described above. Available only when the Navigation Speed Mode is set to Random. Navigation Speedpp Name Name of the float per-particle attribute containing the Navigation Speed value to use. For more explanations about how to use ppAttributes, see ppAttributes Handling. The Navigation Speed is set to 1 if the pp attribute name is empty or invalid. Available only when the Navigation Speed Mode is set to Per-Particle Attribute. Dynamic Speed/Acceleration When enabled, the Navigation Speed and Acceleration will be reread and changed dynamically while the behavior is running. Max Linear Acceleration Determines the max change of linear velocity when new velocities are computed. Higher value will allow a better reactivity but with the risk of glitches in the animation (unit: meters/second²). Max Angular Acceleration Cap the acceleration that can be produced by the blending to avoid too abrupt changes in chosen animations. In case the Delaunay triangulation, produced by locomotion database, has some very flat triangles, this may help having some fluid blending. Note that the preferred solution would be to have a coherent locomotion animation set that does not produce flat triangles. The boldness attribute of an entity controls how much an entity takes his neighbors into account in the navigation algorithm. The greater the boldness the less the entity will try to avoid its neighbors, simulating a "bold" behavior. Random: the boldness is set randomly between the values Boldness Min and Boldness Max. 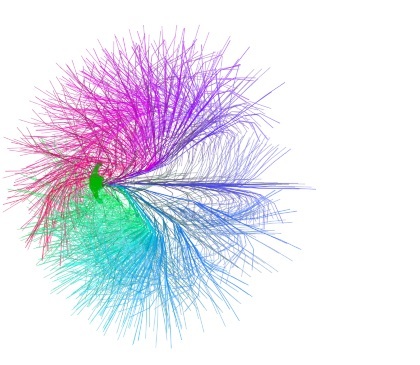 The boldness is influenced by the random seed of the Crowd Manager. Per-Particle Attribute: the boldness is read from the per particle float attribute given by Boldnesspp Name. The Boldness value is between 0 and 1. Boldness Min See the Random option of the Boldness Mode described above. Available only when the Boldness Mode is set to Random. Boldness Max See the Random option of the Boldness Mode described above. Available only when the Boldness Mode is set to Random. Boldnesspp Name Name of the float per-particle attribute containing the Boldness value to use. For more explanations about how to use ppAttributes, see ppAttributes Handling. The Boldness is set to 0.5 if the pp attribute name is empty or invalid. Available only when the Boldness Mode is set to Per-Particle Attribute. Time interval in which the entity predicts other entities/obstacles trajectories to calculate the path to avoid it. A low value of 1 sec for min and max, means the entity predicts the position of others 1 sec ahead. The actual extrapolation time is computed as a weighted average between the two parameters, using the boldness as weight (i.e. Extrapolation Time = Boldness * Min Extrapolation Time + (1 - Boldness) * Max Extrapolation Time ). More details in the Trajectory selection part of the algorithm. If checked, the motion will be blended with time warping on limbs. Time warping is a technique that allows to locally change the speed ratio of a motion to ensure better synchronization with other motions. Enabling time warping gives better results in most of the cases, but may produce some glitches in the motion sometimes. Create Neutral Animation If Needed If checked, an empty animation will be added in the Motion Clips set to ensure there is a motion for null linear and angular velocities. Note that the impact of each of theses parameters is better explained in the Trajectory selection part of the algorithm. If checked, two commands will be used for each extrapolated trajectory. This option allows entities to better anticipate hard turns or angular changes, but at an heavy computation cost. Number of points in the trajectory extrapolation. Sampling Side Offset Angular offset added to the angular speed distribution. A value of means as much trajectories extrapolated on left and right, while a non-null values means more trajectories extrapolated on one side than the other, and therefore more chances to avoid obstacles from this side rather than the other. 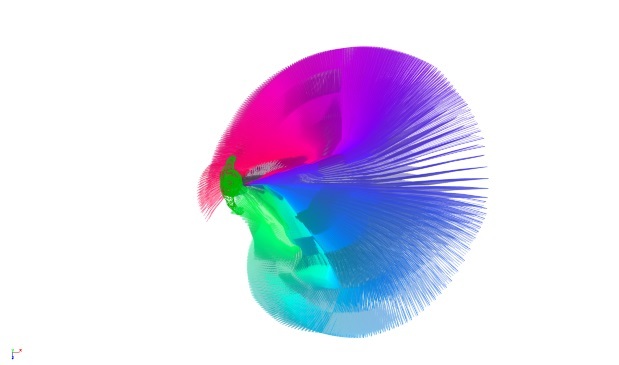 If checked, the motions will interpolate postures between frames of the animation. This usually gives better results, but if your motions have a framerate superior or equal to the Maya framerate, this option can be unchecked for performances purposes. Match Trajectory Orientation Check this option to try to match the orientation towards the target while selecting trajectories. A negative value gives more weight to the linear distance (-5 means 1.5 times (50%) more weight for Linear distance than Angular distance). Note that linear distance and angular distance have different units: meter for linear distance and degrees for angular distance. Look at the Trajectory selection part of the algorithm for a more detailed explanation. a negative value means points at the beginning of the trajectory have more weight than points at the end of the trajectory. Look Trajectory selection part of the algorithm at the for a more detailed explanation. Defines the Locomotion Behavior Visual Feedback displayed in the Crowd Visual Feedback. For common Visual Feedback attributes see Behavior Common Attributes. Show the locomotion model relative to the set of motions added to the Locomotion Behavior inside the Crowd Visual Feedback. The size of each dot is related to the Motion Clip current weight in the locomotion model. A tooltip with the detail of the relative Motion Clip is available upon each intersections. Current: Show only motions currently used, i.e. motions with a non null weight. All: Show all motions of the Locomotion Model. 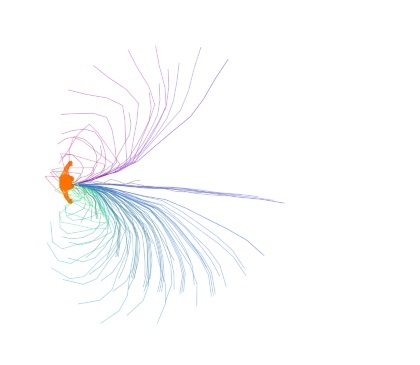 Display all trajectories that are computed from the current position/velocity and with the given set of motion and sample count. All: display all trajectories wether in collision or not. 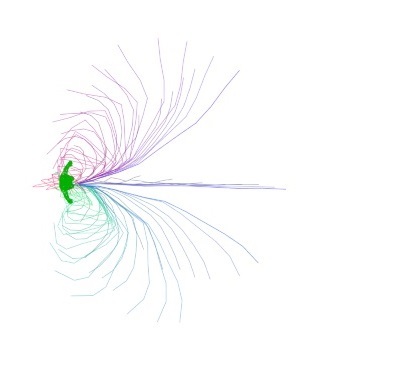 Candidates trajectories are displayed colored while dismissed trajectories are displayed greyed. Depending on the animation set, a one-dimension locomotion database might be detected as a two-dimension one, inducing some wrong blending between the motions at the extremity of the database. If such a thing occurs, the way to fix it is to increase the Delaunay Database Epsilon parameter located in the extra attributes of the Locomotion Behavior. 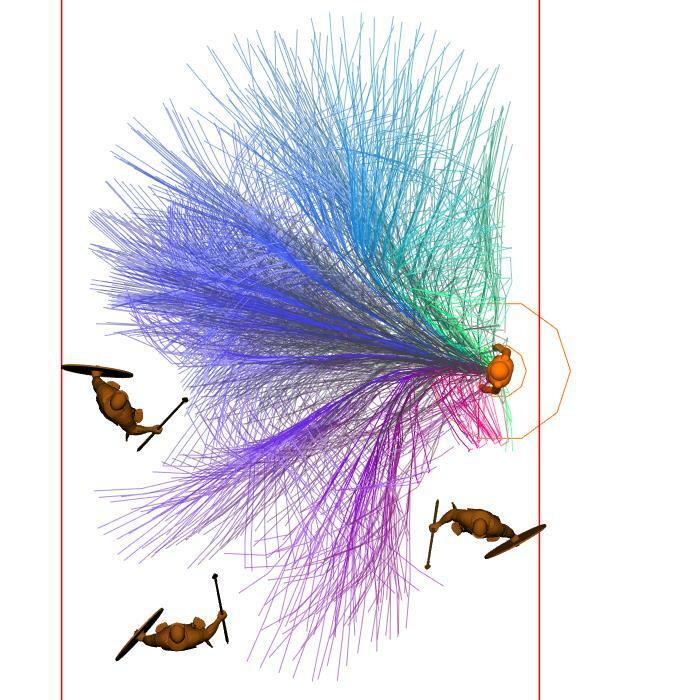 The Navigation and Locomotion Behavior works by predicting trajectories with different blending weights and computing penalties for each trajectory (depending on their distance to obstacles/entities, to their speed compared to the desired speed, the fact that it goes toward the target or not, ...). The behavior then simply select the trajectory that has the less penalty, and uses the blending weights it corresponds to drive the animation. This process is repeated every few frames. 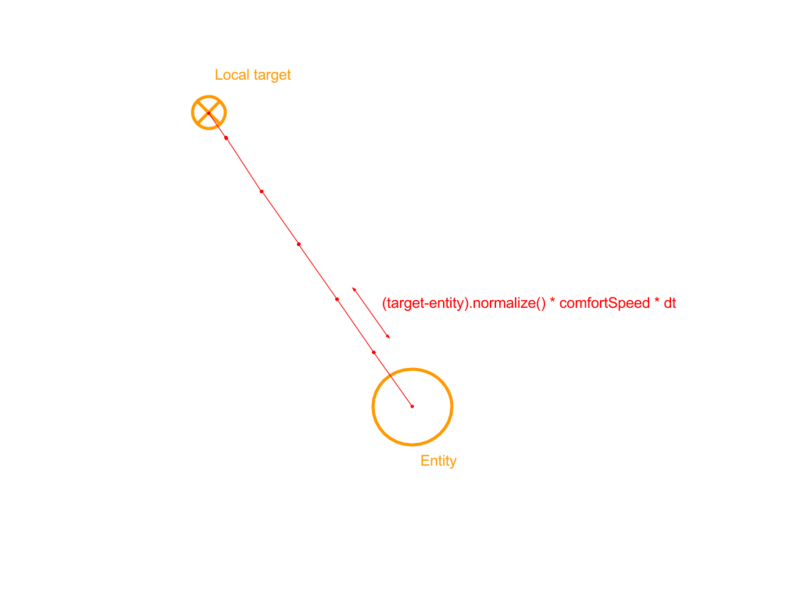 Trajectory selection: a penalty is computed for each remaining trajectory, and the linear/angular velocities for the trajectory with less penalty is chosen. In this figure, connected dot represents a different Motion Clip with its linear velocity on ordinate (vertical axis) and its angular velocity on abscissa (horizontal axis). The dots are connected together to form triangles, and any linear/angular velocity inside these triangles can be reached by blending the 3 motions forming the triangle with different weights. 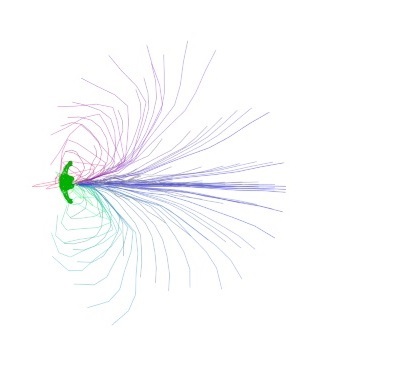 This parametric space is sampled with a given number of samples in linear velocity and angular velocity, and a trajectory is predicted for each sample. Note that using an odd number for the count of angular speeds allows to have samples at null angular speed and evenly distributed on both sides. Trajectory prediction for each sample in the parametric space. Color of the trajectories according to their linear and angular speed, as seen in the parametric space (up) and on the trajectory prediction (bottom). The sampling side offset value will be used to offset every angular sample. This will produce more samples on one side or the other, so might should allow to set an avoidance side preference. The dual command option allows to compute trajectories that use one sample of speeds values for their first half, and another for the second half. It help taking into account hard turns or hard stops. 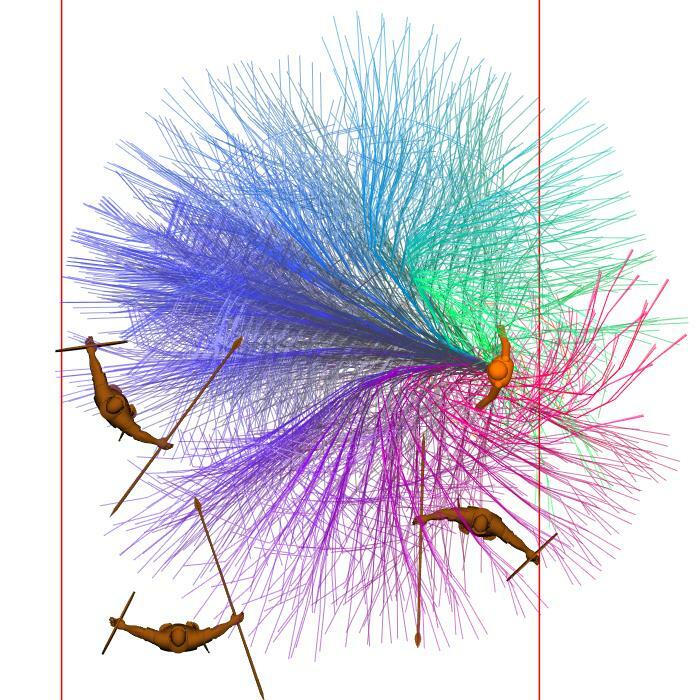 But using the dual command option comes at a cost: it multiply the number of trajectories that need to be computed. For instance, if the Linear Speeds count is set to 10, and angular speed count to 15, it produces 10x15=150 different first half of trajectories to compute. If dual command is enabled, it produce 10x15=150 different second half trajectories for each first half, so 150x150=22500 different trajectories. If each trajectory is 10 points, it's 225000 points to compute. For a simulation of just 100 entities, that would already be up to 22 500 000 different points to compute every few frames. Collision checks simply get the list of perceived entities and obstacles (obtained from the sensors and perception) and check wether it collides with the predicted trajectories or not. 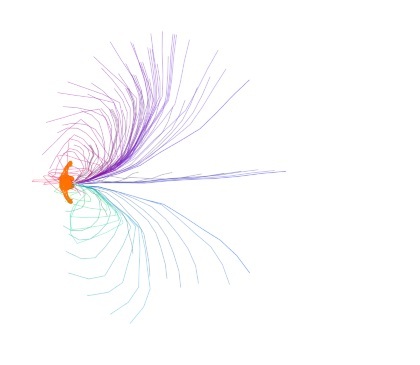 Any trajectory that collides with an entity or an obstacle is dismissed for the next part of the algorithm. Once trajectories are sampled, and colliding ones are filtered out, all other trajectories remain available, and a choice has to be done. The selection rely on penalties: different penalties will be computed for each trajectory, based on several criteria, and the trajectory with the lowest penalty will then be selected. The distance to trajectory is the distance between the desired trajectory and the predicted trajectory for a given set of parameters. 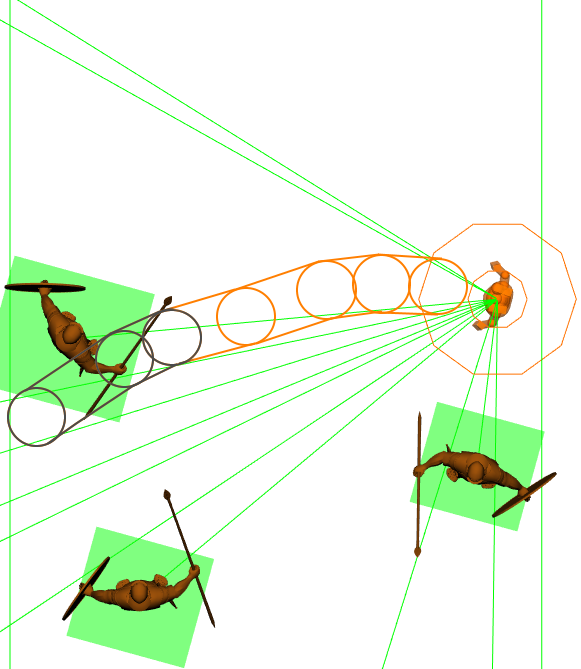 The distance is computed for each point of the trajectory, and summed together to obtain the full distance penalty. The desired trajectory is defined has the trajectory that point toward the current target at the comfort speed. The linear distance is the sum of Euclidean distance between each point of the desired trajectory and the equivalent point on the predicted trajectory. The angular distance is the sum of the angular difference between each point of the desired trajectory and the equivalent point on the predicted trajectory. This computation is optional. If not used, any pelvis orientation will have the same chance of being selected, while when used, it will allow to prefer pelvis orientations that points toward the target rather than other orientations. 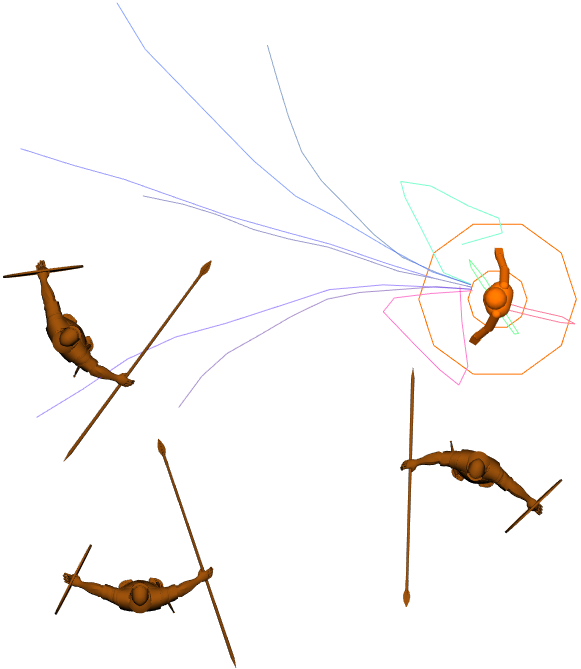 This changes the relative weight of distance computation for each point in the trajectory. The distance to comfort speed penalty represents how the difference between the comfort speed and the predicted trajectory's speed. 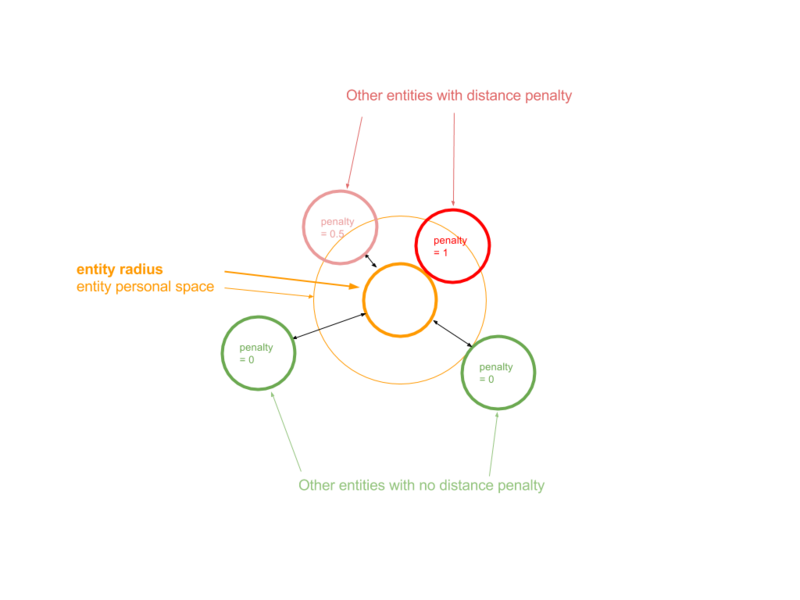 The distance to entity penalty is computed such that it is 0 when the distance with any other entity is further away than the entity's personal space, and 1 when the entity touch another one. The distance to obstacle penalty is computed in a similar way: it is 0 when the distance with any obstacle is further away than the entity's personal space, and 1 when the entity touch the obstacle.